The Carden Chronicles: Who Really Owns the Parks? Before this last week, I thought that National Parks belonged to the "People" of the United States- that National Parks were lands set aside and held in Trust for not only those alive now, but for future generations- that the purpose of the National Park Service was to serve the People, maintain the parks and to serve as guides to help people enjoy the Parks. 1st- the lands are set aside to serve as a rally location for those that agree with the current Regime - like the Pro-Amnesty rally on the Mall this last week (despite the shutdown). 2nd- Parks exist for the President to use to inflict personal pain on Americans and visitors - the "make it hurt strategy"- by preventing people from "looking" at things within the Parks from private areas (such as shutting down road pull off areas in South Dakota that are outside a national park so people could not even see Mt Rushmore), or closing access roads to allow people to look at one of the 7 Natural Wonders of the world by closing sidewalks that pass a wall that lists the names of those that died serving their country (Vietnam Memorial). Apparently the Park Service exists to close roads, sidewalks, harass citizens, and to do the bidding of the President, to "make it hurt." A great number of our National Parks are natural wonders- they existed LONG before there was a US Government and will continue to exist long after the US Government is gone. These Parks were not "built" by the Government. Yes, at these parks, roads, visitor centers and other structures were built- sometimes before the park was a "Park"- but the fact remains that with these natural wonders, people are more interested in viewing the "handiwork of Almighty God" than they are in looking at the wonders of the visitor's center or the fee collection booth. The Grand Canyon does not get covered with a big tarp or filled in with dirt just because Our Great Leader, Barack the Petulant (Peace be Upon Him) said the Government is closed. These parks could ALL be open now- the US House passed a bill to fund the National Park System- but the Democrats in the Senate have said no as has the President. Many of the States offered to fund their Parks as soon as the shutdown began- however, His Royal Petulantcy said no. Finally, the Regime has told the states that the Parks may open, if the State foots the bill - instead just approving the Park Service funding bill and opening all the parks in every state and territory. Last evening on the news we saw Gov. 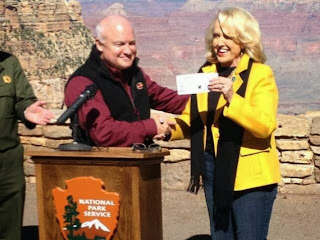 Jan Brewer of Arizona hand over a check (ransom payment) to the National Parks to allow Arizona to re-open Grand Canyon. Maybe now that the Parks are starting to open, we will stop seeing the Parks being used as Political Weapons.